Do you believe that some people just don’t care? This is a random question I know…and a vague one at that. Yesterday I got out of work early so I did my usual routine of afternoon meditation then the gym. It was nice to get done a little earlier because it gave me a little extra time to do some things…download music, enjoy a long shower, grill steaks, etc. I decided to crawl into my bed last night after dinner and just relax my body and my mind. I checked out Netflix and decided I was in a documentary kind of mood. So much for turning off my mind. 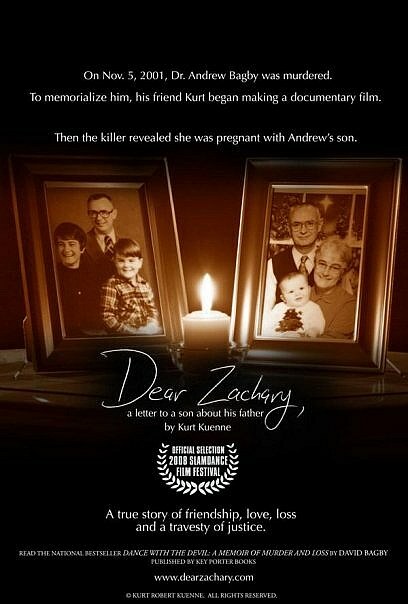 I had read different reviews for the past few months on a documentary titled Dear Zachary: A Letter to A Son About His Father. While surfing through documentary titled I stumbled upon it and decided this was the night to check it out. What a sad but beautiful story. Hands down I believe everyone should watch this because it gives such an honest look into the judicial system and an eye opening realism of how governments can be completely blind and completely crooked. The filmmaker is a childhood friend of Bagby, and when he begins making home movies, Bagby frequently appears in them. As they become more professional in quality in later years, Bagby invests in them as well. Bagby is a 28-year-old medical student when he meets Shirley Jane Turner, a twice-divorced Canadian American general practitioner thirteen years his senior. Bagby’s parents, friends, and associates are wary of the relationship, but initially Turner seems to keep Bagby grounded and relatively free of stress as he pursues his career. Turner lives and works in Council Bluffs, Iowa, while Bagby works as a resident in family practice in Latrobe, Pennsylvania. Eventually, the relationship crumbles and they separate. Turner returns to her home but then drives almost 1,000 miles overnight to meet Bagby at a local park on November 5, 2001. Bagby’s body is discovered there the following day, face down with five gunshot wounds. Turner becomes the prime suspect in the murder investigation. Facing extensive evidence against her, she flees to St. John’s, Newfoundland. Extradition proceedings are initiated as Turner reveals she is pregnant with Bagby’s child. While extradition is pending, Turner is not held in custody. She gives birth to a boy she names Zachary. Bagby’s parents David and Kathleen move from Sunnyvale, California to Canada, determined to gain custody of their grandson and obtain Turner’s rendition for a Pennsylvania trial. In late 2002, a Supreme Court justice in Newfoundland rules that there is sufficient evidence for an American or Canadian jury to conclude Turner killed Bagby, and she is taken into custody. Turner writes to a judge and receives a response detailing how to appeal her arrest and subsequent hold in jail. Turner is released by Justice Gale Welsh, who feels she has exhibited no behavior that suggests she poses a threat to society in general. Turner thus regains custody of Zachary. On August 18, 2003, Turner, carrying the 13-month-old infant Zachary, jumps into the Atlantic Ocean from a fishing wharf in Foxtrap; both perish. The reason I chose the question of whether some people just don’t care is because this innocent man and this innocent child were killed and both could have been prevented (especially the 13 I couldn’t help but wonder while watching this film and even after watching it what some people are wired like. I do not know any specifics when it comes to understanding genetic makeup or brain chemistry and functioning. I am completely clueless when it comes to most things dealing with science and the functioning of the body. I just couldn’t stop thinking that some people have to have certain sort of genetic and chemical makeups that make them so uncaring and so selfish. The judicial/governmental system of Newfoundland put the “care” of this child into the hands of a killer. One judge even said that she was not a threat to anyone in the community because killing the man that she did was an isolated incident and she was only angry at him. This woman had 8 restraining orders against her prior to killing Andrew and Zacahary Bagby. This woman had 3 other children all with different last names and she had no relationship with them. This woman met a man 2 weeks prior to killing her son and when he was not interested in pursuing a relationship after 2 dates she called him 200 times. Again, I do not know anything about human makeup, DNA, etc. but these things would certainly indicate that this woman was absolutely, 100% suffering from some form of mental illness. She was a sick individual that took the lives of two innocent people and it was well-known by friends and family. The parents of Andrew Bagby (Zachary Bagby) were allowed visitation rights with Zachary while he was alive but many of the visitations had to be supervised and many of the visitations they had to share with the mother (Shirley Turner). I cannot imagine what it would be like to visit my grandchild and have to sit in the same room with a woman that knowingly killed my son and have her act as if nothing was out of the ordinary. I can’t even start to describe the details in this entry because I believe people really need to see the film….and describing the film wasn’t my original intent. My original intent was answering whether some people just don’t care. In this case there were so many people that were involved that were fully aware that Shirley Turner killed Andrew Bagby yet they still allowed her to raise this child. One woman worked as the head of a child protective service agency and she allowed the entire case to be brushed under the rug. Is this just a case of laziness? Is this the way that government really works? Do some people just choose what they think is important? Did any of them feel any remorse after this little boy was innocently murdered knowing that it could have been prevented? Did anyone think about the emotional stress that this has taken on the parents/grandparents of Andrew and Zachary Bagby? Are some people just designed to be robots? Do some people just lack that piece of DNA that makes them care about others? Innocent people die every day and the number of cases that could have been prevented is astronomical. I understand that some things slip through the cracks and some people already do the jobs of 20 people but I cannot wrap my brain around someone knowingly putting a child’s life into the hands of a known killer. Have we become a society so self-absorbed that nothing else is important except what happens to ME ME ME???? Has money become the source of power for the majority and it is now the thing that controls us even if the outcome means death of the innocent? I have been thinking about this subject a lot lately because I believe that there is SO much going on in this world that I am obviously clueless about. I want to give people and the government benefit of the doubt but it is becoming harder and harder to do. I am starting to wonder if people (some not all) are becoming more accustomed to a robotic lifestyle and becoming un-phased by murders and horrific acts because they have become a daily norm. I wonder what drives people to go into politics and what their true motives are. I will always make MY life as beautiful as possible and I will ALWAYS help those around me because for me that is the only right thing to do. I will always be an advocate for the rights and safety of children. I will always fight for equality. I will always encourage women and be a mentor when needed. Sadly, I believe the governments of the world have become very corrupt and fewer and fewer people have the same goals as I do. I believe people get burnt out and their ability to care becomes less and less. Change is not something that happens overnight. Change is something that takes hours and days and years of hard work and we don’t always get the result we want but when you believe in something, even when you feel like you have been kicked down a million times, you keep fighting for it. As I sit here I just keep thinking about the world around me and I am an optimist but I am also a realist. I admit to being scared of where the world is headed. I continue to think positive and I continue on my journey of helping when and where I can to improve my life and to help improve the lives of others but the world is HUGE and my dent in the world can only be so big. It is these things that makes me question whether I really want to bring children into the world. People can tell me that I should not live in fear….I am not living in fear…I am living in reality Stories on the news become more frightening every day. Government becomes more corrupt and we are losing human decency. I don’t want to think negatively….but I am human and sometimes I feel lost because I don’t understand why certain things happen in the world. I started this blog in hopes of encouraging people. I certainly do not have all of the answers and I have my days when it seems like everything is just falling apart but I have changed. Even through the worst of times I repeat to myself over and over again how beautiful life is and can be. I have faith that everything can be better if we work toward that. I sit here in hopes of inspiring others and reaching out my hand to those that might need it. I sit here in hopes that in turn you (the reader) will do the same and maybe cause a huge chain reaction. The world does not have to be this place that is becoming scary to the point of not wanting to leave our homes. The world has great potential and in my opinion we just need a lot more positive energy to pass around….anything can become an addiction if we repeat it enough times. Why not continually tell ourselves and tell others of the value that they hold as well as give them the help that they need when we know it is needed. Too many people scream out for help but receive nothing. Let’s change that here and now. I challenge you to take the time out to “honor” three people in your life….spend time with them, tell them what they mean to you, offer your help, etc…..make them believe that everything is NOT going to fall apart….give them hope. PAY IT FORWARD….but remember that the job of these three people is to pay it forward to three other people as well. It really can become a revolution if we work hard enough and care enough. I definitely care. Do you? Great post! It is truly scary when we see people in the world who only care about themselves and have little to no regard for others. I believe that we have a choice as individuals in everything we do, and hopefully readers take note of your choice to do the right thing and reach out to others. Hopefully they will feel encouraged to do the same – I know I do! What an incredible story. I can forgive the lack of caring on the part of one person, but when there are so manny people involved with damning evidence— really? That’s unforgivable. I do think there are a lot of people who just don’t care or are too lazy, but I continue to believe that most people are good and want to help. Like you say, it’s important to be the change we want to see. It is through our own actions that we show what we value. Thanks for the great post! This is the kind of thing that tears your heart out and perplexes the mind at the same time. Yes. Some people just don’t care. Especially if it doesn’t affect them. Nothing ever shocks me anymore . She not only murders 1 person, gets away with it, and then murders her innocent child. I cant even begin to comprehend what type of thoughts or mind that woman lived in, obsessive, obviously angry enough to murder and they stillllll let her have her child!!!What? This is a great post I will definitely check the documentary out. Great post! The documentary is very well done and very moving. Coming from a family of lawyers, I know how it can sometimes be more the win than the justice. BTW thank you for visiting my little corner of the internet! I love the whole 365 questions thing! What a great idea for a linky!!!! …rights of the PARENT over … Sorry about the missing word. Please add. Anyone who has ever flown on an airliner has seen the safety presentation at the beginning of the flight. The flight attendant always tells the parents to put the oxygen mask on themselves prior to putting it on their children. This scenario came to mind when I read your post. If each one of us works on being the healthiest we can be, we will be healthy enough to help those around us. Positive attitudes are contagious. Beautiful post. Some people just don’t. But most are just self interested and ignorant. Have you ever noticed on police dramas how the FBI will withhold info from the NSA who refuses to work with the police who argue jurisdiction with NCIS. They miss the forest for the trees. Victims don’t care about their bureaucracy, they care about justice. Sadly, doing the right thing isn’t a moral imperative for many people…protecting turf and honor is. Mental illness can’t be 100% controlled by the sufferer. It’s our job to recognize and help them. These people didn’t help her, or her victims. Justice Gale Welsh who made the decision to let this murderer out on bail, and effectively was the reason this young baby was murdered continues to work in the justice system in Canada. Clearly, she has acted negligently and should have been fired, lost her license as a justice and probably punished. Yet. I have not found anywhere on the internet any investigation or coroner report investigating her decision and how it could have possibly occurred. There is no indication she has ever made a public statement or apology or anything of the like. In fact, it seems the Canadian government has defended her and allowed her to keep practicing. I cannot understand this. Justice Welsh overturned on appeal the case of a women in Newfoundland who was wrongly “exposed” by her University prof as a sexual abuser. This prevented her from attending a degree in social work and hurt her job prospects . It was subsequently found that the evidence her teacher relied on was completely false. The student was not aware of this characterization of her. When she found out, she sued and the court awarded her 800,000.00 but Judge Welsh on appeal said she could not sue the university. I have also searched the internet and the the Nfld Supreme court web site and could find no mention about any reprimands against Judge Welsh. Judges should be accountable in the same way most of us are accountable.